Watch the first published series aimed at increasing adolescent oral reading fluency in action. Students work in pairs and at comfortable reading levels, practice reading aloud a narrative fiction or nonfiction passage from the nonconsumable Reader. A partner uses the consumable Reader's Record, marking errors and scoring the oral reading. 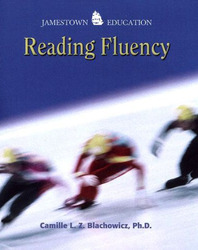 Repeated readings encourage students to increase their fluency. New Audio CDs allow students to hear fluent reading models for all selections at all levels.